Updating your home can seem like a huge blank, especially if it’s been a while. 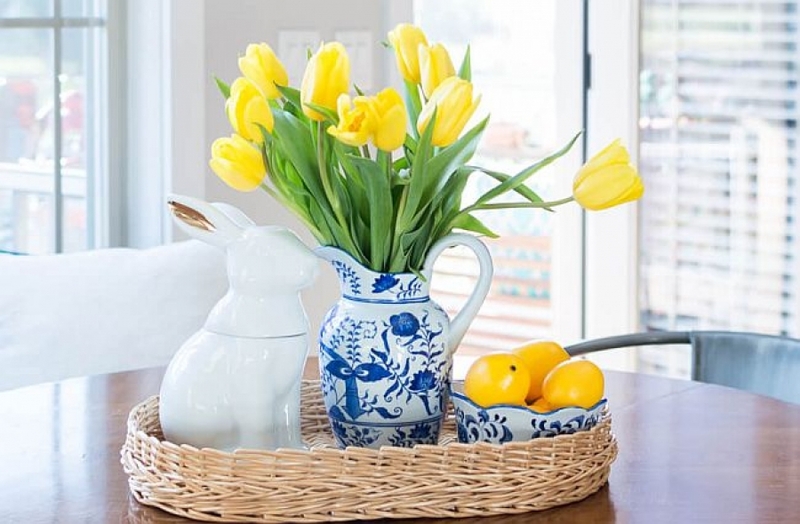 But there are easier ways to freshen it up and make it look spring and summer ready that won’t break the bank and won’t create a long drawn out hassle. Each of the each of these updates represents a current trend and something you can pull off yourself this weekend if you’ve got a little time a little scale and a little skill. Some of the freshest rugs out there combine a couple of trends. There was a time when the Persian rug dominated informal spaces. Take a look at this one from Wayfair? The Warren luck brings in vintage feel but the color palette is all new. This is an easy and affordable way to instantly update a living room with fresh, bold colors that will get you were space noticed. Mixed prints have been all over the runway, and you can create a similarly textured and stylish look at home. Mix it up, mash it up, and freshen it up with an assortment of prints – florals, houndstooth, stripes, graphic patterns. You can create a look that brings depth to your space by using one main color as your anchor and then creating a mix of patterns around it. Your basic scratching post or dog bed may fade into the background for you but they can stand out like a sore thumb to visitors. Pet decor has come a long way, and no matter what style you’ve got going on at home, you can find something to match, blend in, or even stand out—for all the right reasons. Stores like HomeGoods and Target and blank all have tons of options that are affordable. But if you’re looking to break the bank, perhaps consider this. Lowe’s and Home Depot have both been running spring specials with appliances that are 35 to 40% off. These discounted prices could easily lead to you redoing your whole kitchen, but a new fridge Cheryl freshen up your kitchen. If you really want to make the purchase of painless, look into financing and both of the stores if you can get the 0% interest deal over 24 or 36 months you really don’t feel the crunch of putting out a lot of money upfront. Another easy way to bring an additional layer of interest to your home is with modern window coverings. Already have blinds or shutters? Framing the windows out with drapes that can be changed seasonally is a great way to create an interior that always looks updated and call attention to the outdoors and to your architecture (or create architecture where there isn’t much).